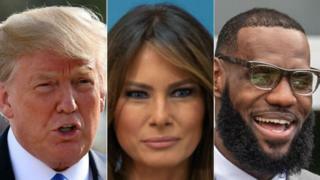 US First Lady Melania Trump has backed basketball player LeBron James, hours after her husband made insulting remarks about him on Twitter. James had said in an interview that Mr Trump was divisive and had emboldened racists. In response, Mr Trump questioned James' intelligence, saying it was not easy to make the NBA player "look smart". However, Mrs Trump's spokeswoman said James was "working to do good things" with a school in his Ohio hometown. She said Mrs Trump wanted "to have an open dialogue about issues facing children". Earlier this week, James told CNN during an interview with Don Lemon that sport had offered him the opportunity to meet people of different backgrounds and race. "Sports has never been something that divides people. It's always been something that brings someone together," he said. "He [Mr Trump] is dividing us and what I noticed over the last few months is that he's kinda used sport to divide us and that's something I can't relate to, because I know that sport was the first time I was ever around someone white." He also argued that Mr Trump's actions had encouraged racists, saying: "I think [racism's] always been there. But I think the president in charge now has given people - they don't care now, they throw it to your face." On Saturday, the president responded on Twitter by saying: "Lebron James was just interviewed by the dumbest man on television, Don Lemon. "He made Lebron look smart, which isn't easy to do." Mr Trump also suggested that he prefers NBA legend Michael Jordan over the LA Lakers star. The president's endorsement of basketball star Michael Jordan was perhaps a reference to the long-standing debate over whether Jordan or James is the better all-time player. However, Jordan also expressed support for James. He told media outlets through his spokesperson: "I support L.J. [LeBron James]. He's doing an amazing job for his community." BBC North America reporter Anthony Zurcher suggests the first lady's statement contains veiled criticism of her husband's tweet. During the interview, James also discussed a new school he has opened for underprivileged children in his home town of Akron, Ohio, which offers free meals and bikes to students, as well as job placement assistance for parents and an on-site food bank. Interviewer Don Lemon criticised Mr Trump's tweet, and responded by referring to the separation of child migrants from their parents: "Who's the real dummy? A man who puts kids in classrooms or one who puts kids in cages?"